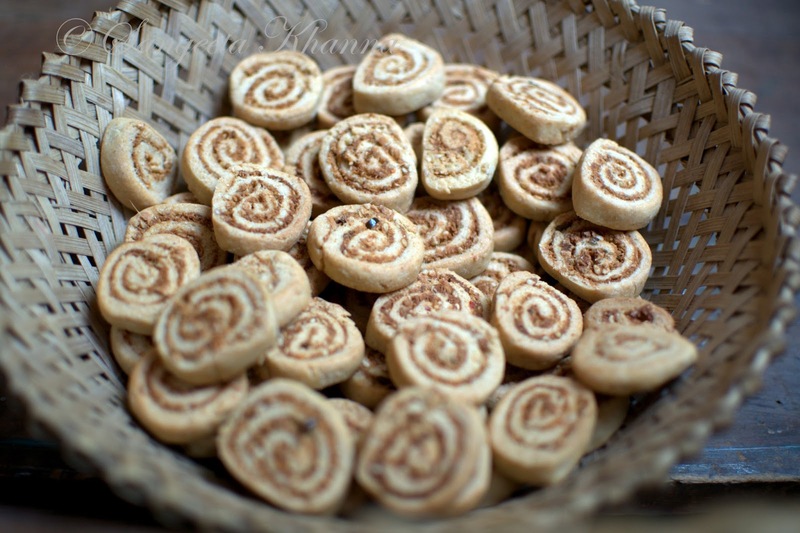 banaras ka khana: baked bakharwadi | a baked Indian snack that beats a cookie any day..
baked bakharwadi | a baked Indian snack that beats a cookie any day..
Bakharwadi is a traditional Maharashtrian snack that is like a sweet, sour and savory fried cookie. That too a pinwheel type. I used to love the fried version long back and would request anyone visiting Mumbai or Pune or even Goa to bring me one. There is a packed Bakharwadi by Chitale Bandhu and then there is one by Haldiram's that is really good. But those are fried and one feels bad when reaching out for such fried packaged snacks. We have been off any packets namkeens for a long time but on a recent travel when the flight got late by an hour, we found ourselves straying into a Haldiram's kiosk and getting a pack of Bakarwadi. The packet was savored slowly between the two of us, but got over before we boarded the flight. It was alarming. And then Arvind brought home a packet once more, this one was finished in 3-4 days but was enough addictive to rethink and act accordingly. And act accordingly I did. I baked some. This was after a long long time. I had experimented a lot on Bakharwadi when I bought my new microwave oven more than a decade ago. 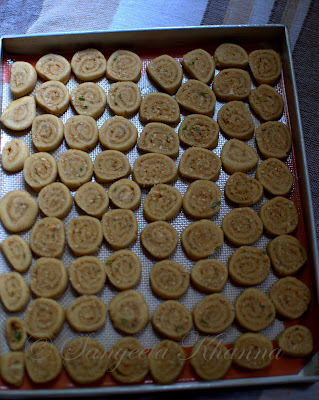 The best shape I could get around that time was through microwaving the rolled and cut Bakarwadis briefly and then frying them. 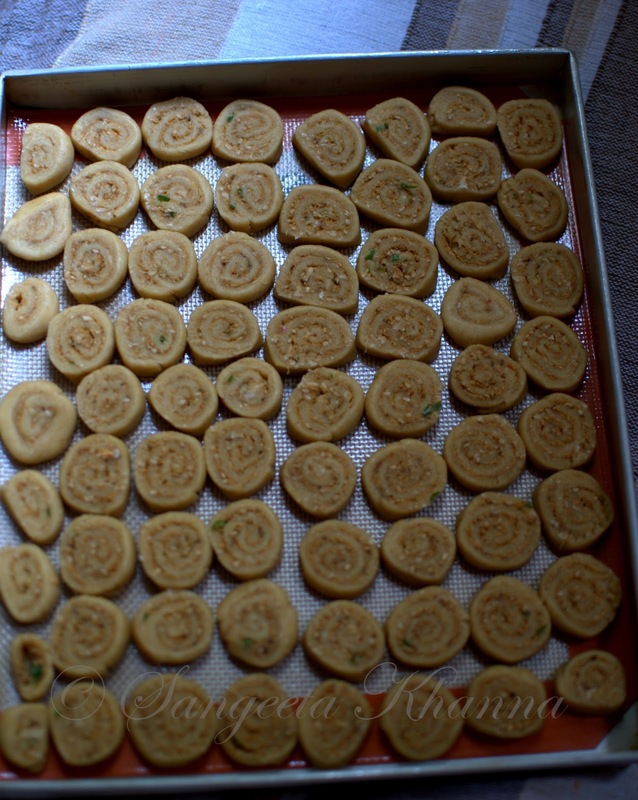 This seals the edges and the filling, and allows the Bakharwadis to fry quickly so they absorb less oil. But they didn't turn really crisp. I was not confident enough to bake on combination mode of the microwave oven. Later when I bought the conventional oven for my breads, the same recipe was adjusted a little bit and gave me good results just by baking. So here it is. Mix all the ingredients for the pastry dough and knead a stiff dough adding water slowly as you mix. Rest the dough till you prepare the stuffing. Soak a lime sized ball of dry tamarind in a cup of water and microwave it to make the tamarind extract. Sieve and save for later use. Dry roast the sesame seeds in a kadhai or any suitable pan. Low flame will ensure even roasting, add the poppy seeds as soon as the sesame starts crackling. Within a minute, add the grated fresh coconut and roast again for about 3-4 minutes or till it starts getting fragrant. 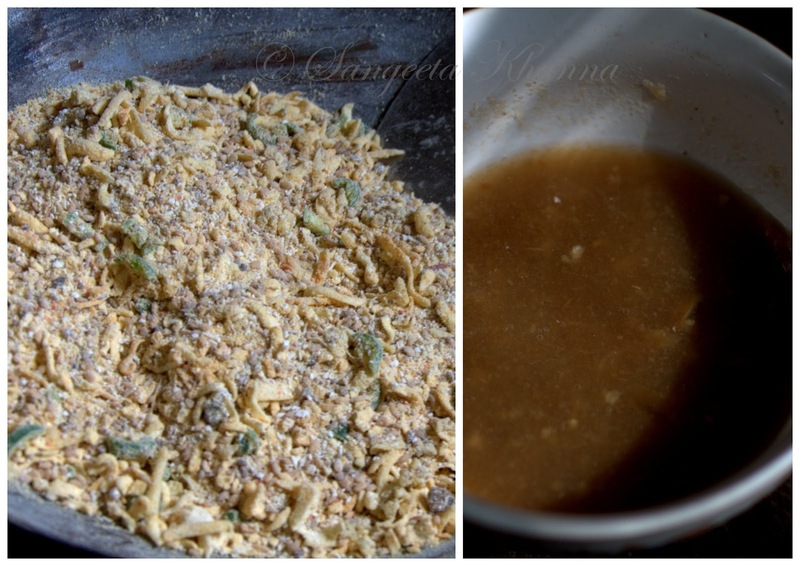 Lastly add the besan and the dry coconut powder and roast for a couple of minutes, just to mix everything together. 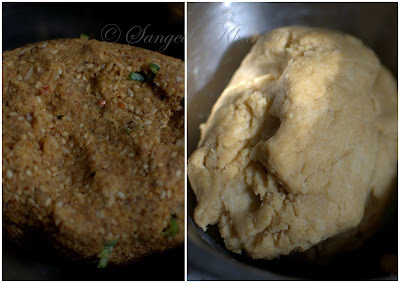 Cooking the filling completely is not the idea, just to cook the besan briefly, the rest will be cooked during baking. Add the green chilies, ginger and the other powders, the brown sugar and salt, mix well. Now sprinkle the tamarind extract over this mixture and mix with the help of a spatula. This stuffing mixture will come in the consistency of a paste that is not too wet. Add tamarind extract keeping the consistency in mind. Too thin extract will make it wet and less sour than required. The pastry dough is already waiting, the filling is ready. Now is the time to do some rolling. 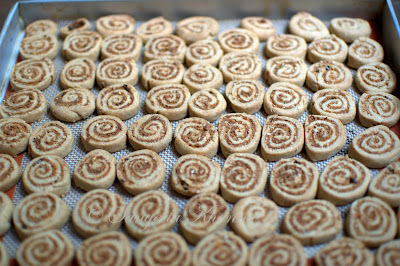 Divide the dough in 4 -5 portions and roll out on a board to make a rectangular sheet. Thickness of the pastry will be about 3 mm. Divide the stuffing too into equal portions and spread out one portion over the rolled out pastry sheet. Just slap it over and spread with the help of a knife blade. Start rolling from the longer side so it makes a longer cylinder when rolled. And then roll the cylinder some more to make it tightly packed. 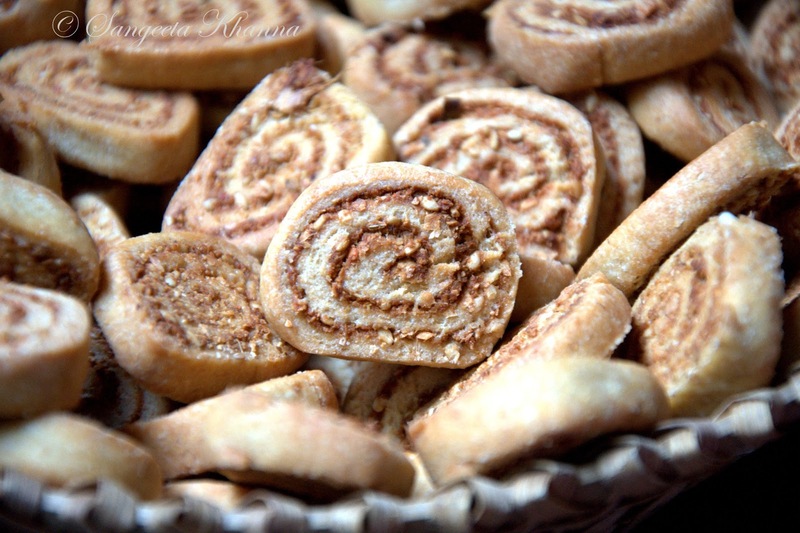 Now slice the Bakharwadi cookies carefully holding the cylinder with the help of your left hand fingers. The sliced cookies may be half moon shaped due to pressure exerted during slicing, just press them all from sides so they become round. 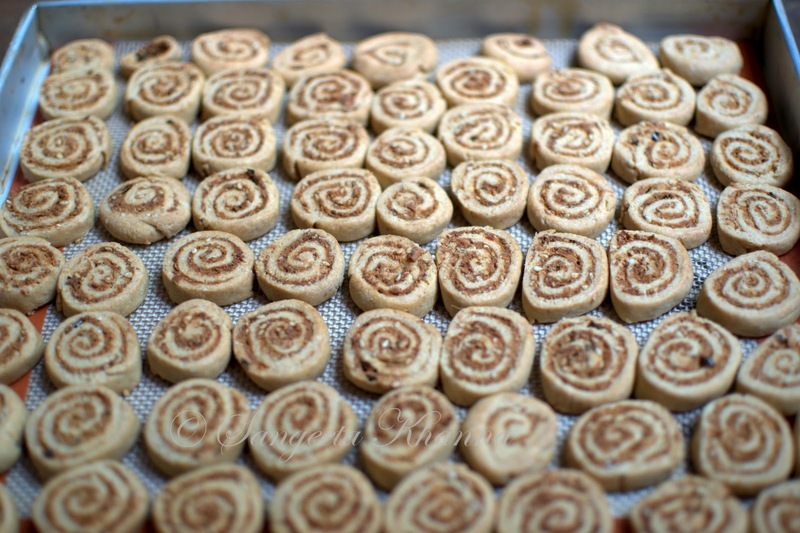 Lay them on a baking sheet or greased baking tray. Bake in preheated oven, 200 C for 20 minutes and then on 180 C for 25-30 minutes. A golden hue will be a sign of readiness. Cool them on a wire rack or a perforated basket as I did. The cookies will be a little damp when freshly baked. They taste good but the texture enhances the next day as complete dehydration is achieved by that time. You can always adjust sweet, sour and hot flavors in the stuffing to suit your palate, the nuttiness of the various ingredients is complex and very very addictive. The sesame, coconut and poppy seeds provide a complex texture too apart from the distinct nuttiness that blends with the sweet-sour-hot-savory taste of bakharwadi. It is a time consuming process but makes enough quantity to last about a week or even a fortnight for a small family. Depends how how you ration them on the go. They are minimal gluten cookies, protein packed and fiber packed so it's not a problem if you binge on them for a while. Tasteful snacks sometimes fix a deep rooted emotional problem and help you get back to track in life. Wow! this is new to me and looks really awesome. will try this shortly. This is the most sought after item in Chitale Bandhu shops of Pune. I wanted to eat them from the screen itself ! I am making this real soon. but I dont get fresh coconut here??? can I substitute with crushed peanuts or any other nuts???? You can use dry coconut or dessicated coconut too Sayantani. 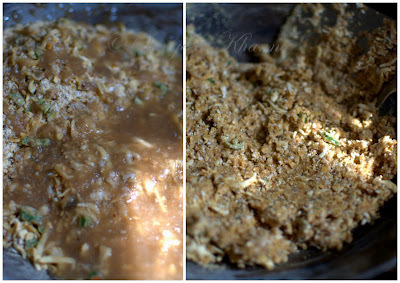 Crushed peanuts is also used in the stuffing normally, but I like it better without peanuts. You can always add some if you wish. They look just like famous Puneri Bakarwadis!! sangeeta. how far this one a healthier version? will not the 3/4th cup of oil eual to deep frying them? You would use about 2.5 cup of oil for this quantity of bakharwadi Nirupama if you deep fry them. The porous and loose stuffing makes them drink up oil when deep frying. bakharwadis are addictive. we just finish the whole pack in a couple of days :-) you have really made it healthy. 3/4 cup oil is ok for me :-) better than frying which would use a lot of oil. Ok, a looooooooong time back I tried to make bhakarwadi at home. It came out ok but I never tried it again because then I discovered that I could get Chitale's from an online shop. 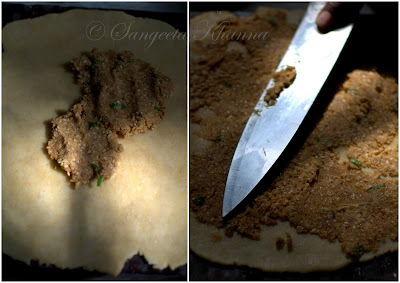 This recipe makes me feel like trying it out again - so thank you, Sangeeta. Man, HOW much I love bhakarwadi! Thanks for recipe will try it on this sat/sun. Baked them today and came out very well....Thanks for the recipe. I am so glad you liked it Sarita. Was the seasoning god for you? Some people would like it spicier I guess. 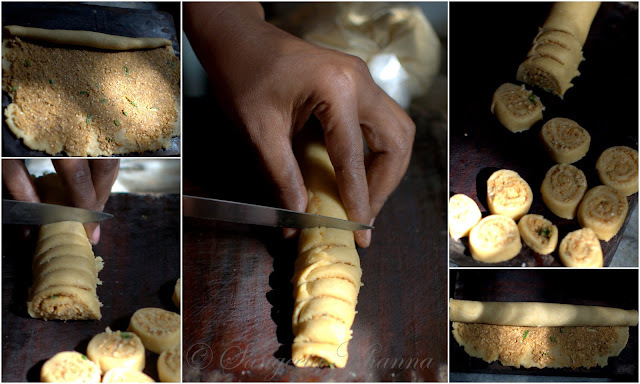 Bakharwadi is one I want to try, I will let you know how it turned out.